I know I look forward to checking out some of these places and am sure that there are many others who would be interested. Eventually the intention is to have a full blown travel guide here at B.G.M.! It is almost obligatory at this point for press releases to praise a band for having a sound like no other. Proclaiming that said band pushes boundaries and transcends genres. A refreshing listen in a saturated market of mediocrity. You really need to check out this band! Seriously 70% of the bands that I get emails about claim they are THE new thing that will spur a wave of clones like never before. Clearly that is a bunch of hyperbole. That being said, all of those grand statements aren’t things required to an engaging and fresh listen. Ruby Karinto are a four piece that don’t need a PR blast to hype their unique brand of strange. Hit play on their debut self-titled full length and I’m sure you’ll agree that these guitar-less wonders created a record that has a sound which is extremely difficult to pin down. If I had to create a magic potion that is Ruby Karinto it would have to include a sprinkle of Roxy Music, three cups of Tune-Yards, a healthy splash of The Knife and then bake it in a pit under a post-punk show. Half of the songs are sung in Japanese and half are sung in English. When listening to standout “Jugemu” it wouldn’t be shocking if fans of Croatian gypsy revival music didn’t reach for their wallets to buy it on the spot. However, with “Ai is a Pencil” it feels like you pranced into some artsy hipster masquerade after huffing some glue with Charlie Day. 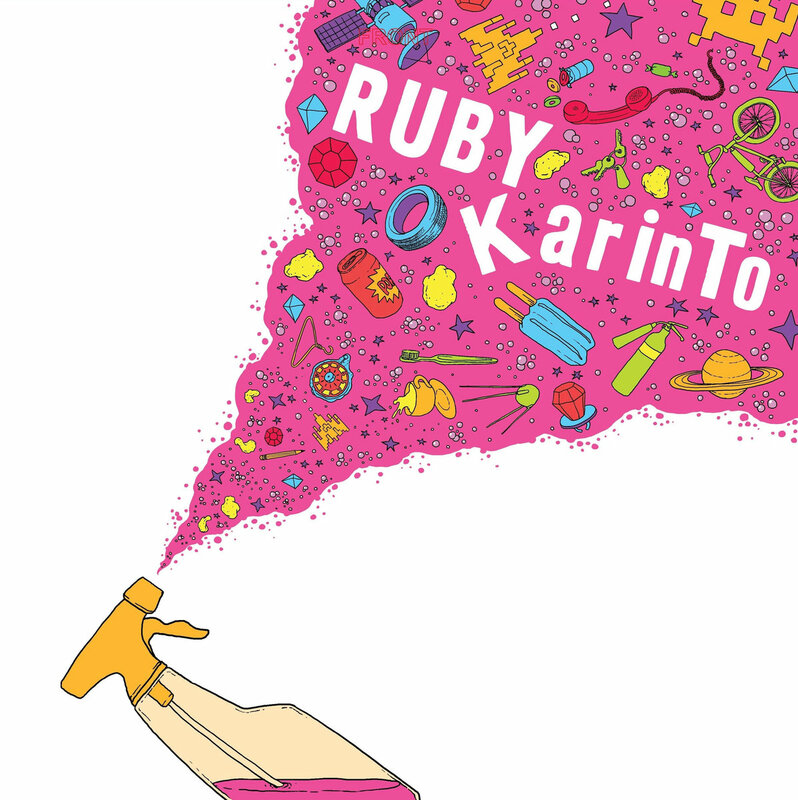 If you want weird yet dance-able music, Ruby Karinto is for you. The backbone of the band is their driving rhythm section. It proves to be playful with the healthy dose of spaced out moog fuckery. It keeps the party moving and would fit in nicely with DFA era Black Dice. I didn’t have anything in my collection that sounded quite like this band and that is not hyperbole. They are releasing the full album on their bandcamp on 4/27/2018. Go pick up this record on some slick wax ASAP. Only pressed a GOLD edition of 100 and black edition of 300. You can buy them HERE. I want to thank Ai Ito & Soma Morse from Ruby Karinto for being so kind and taking part in this feature! Where does Ruby Karinto call home and how long have you been there? Ai) Victoria and I’ve been here on and off for the last 21 years. Soma) Yup, here we are at the southern tip of Vancouver Island. Back when I first started calling this burgh home in the early 90s it used to be know for being the home of the ‘newly wed and the nearly dead’ due to it’s sleepy small-town nature. Not so much any more due to the boom in real estate and increasingly rapid development – I might even call Victoria a city now! Soma) Yeah, I love the Museum’s old town cinema – as a kid I would hang out there for hours. Check out Ross Bay Cemetery. A visit to Cavity Curiosity Shop is always recommended! Another attraction is a solid music and art scene – it’s what has kept me here and fueled my own musical interest and development. Soma) Ai is pretty on point here, in addition I’d probably invite people to have dinner in my kitchen! Soma) Ai likes tea and sodas – we have lots of places that specialize in tea – like Silk Road or Terroir. For sodas check out the Phillips Ginger Beer or anything by Victoria Soda Works. I myself like all kinds of drinks in moderation – even our tap-water is great! Breweries of note for me would be Driftwood or Hoyne. If spirits are your thing Victoria Distillers has been making some very nice hard alcohols like the Empress Gin. For drinks after work my go-to is Agrius if they have room at their bar – they have great beers on tap and killer mixed drinks. Soma) Yeah, all-ages shows are where it’s at! Victoria has everything from opera and symphony to minimal synth, noise, punk and metal. CFUV, the University of Victoria radio station is a good starting point for what’s happening locally in music. From there, I would recommend venues like Logan’s or yearly festivals like Pretty Good Not Bad. Ai) My husband Pete’s go to is Pizza Zone. Soma) Saint Franks for bourbon sours, snacks and drunken video games. Soma) Discovery for coffee and The Ruby for breakfast – try both of their house hot sauces. To get out of town life, what are the nature based options surrounding your city? Any good hikes, camping and other fun outdoors stuff to do? Ai) Mt. Tolmie or Lake Cowichan. Soma) Yes! You are speaking my language. Bike riding on the Galloping Goose Trails, hiking in East Sooke Park or Goldstream Park, swimming at Thetis or Durrance Lakes. That’s just for starters . . . And if you visit Victoria, hit us up on bandcamp – we’ll take you out for a beer or coffee or a soda!